And here we are at #1. I started this list four months ago thinking I’d knock this out in about two weeks. However, if there is one thing about me that surpasses my love for the Spurs, it is my incredible laziness. So without further ado, here we go! Since I was a wee little Spurs fan in 1993, I always wanted the Spurs to have a perimeter closer to take the pressure off of Robinson and Duncan. Timmy has always been great and reliable but I always felt like from 2000-2003 (yes even in 2003), that he would fatigue down the stretch of games. He needed someone to take the load off, ala Kobe for Shaq. I loved Sean Elliott but he wasn’t quite that. For one, hilariously misguided season, I thought it was Derek Anderson. Boy I sure was an idiot. It wasn’t until Manu came into his own in 2005 that my dream came to fruition. Pop gave Manu the keys to the offense down the stretch of tight games during that playoff run and for the most part, the results were incredible. But the real sign of an all-time closer is being able to do it in the most tough of circumstances, with the league’s toughest defense closing in, and an entire season on the line. Well Manu showed what kind of closer he is in Game 7 of the finals against the Pistons. He also showed what a burden he was to his teammates. Granted, this was a complete team effort. Timmy pulled us from the hole in the third quarter and was completely deserving of the Finals MVP. Horry and Bowen hit huge shots down the stretch. Parker sucked on offense but did a damn good job on Rip Hamilton. But man, Manu had this sense of confidence down the stretch of that game that really steadied them on their way to ripping that championship away from Detroit. In the last eighteen minutes of the game, Manu did it all. He had ferocious drives to the basket where he managed to find seams through the entire defense and contort his body unnaturally to finish with a right-handed dunk. He collapsed the defense multiple times, once to get Robert Horry a big corner three, once to get Timmy a wide open jumpshot, and once to stride in for the championship-clinching layup. He hit a big three to give the Spurs some slight breathing room with about 2.5 minutes to play. Then, with the trophy within their grasp, he removed all doubt by hitting all four of his free-throws. The man was 5/6 in the last eighteen minutes of the game with 15 points, 4 rebounds, 2 assists, and only 1 turnover. This all in the biggest moment of his NBA career up to that point. He was calm throughout, decisive with the ball in the fourth quarter, and unflappable in the clutch. Timmy may have unlocked the door but Manu slammed it shut on Detroit. He also celebrated the championship by basking in Timmy’s BO. Before this game, i always knew he was a prime-time playoff performer but this was something else. Seeing how unfazed he was here in the ultimate pressure-packed game, with all the baggage the Spurs came in to this game with (people forget but the Spurs were reeling from Game 3 on…even Nazr Muhammed thought so) there was nothing he could ever do for the rest of his career that would shock me. 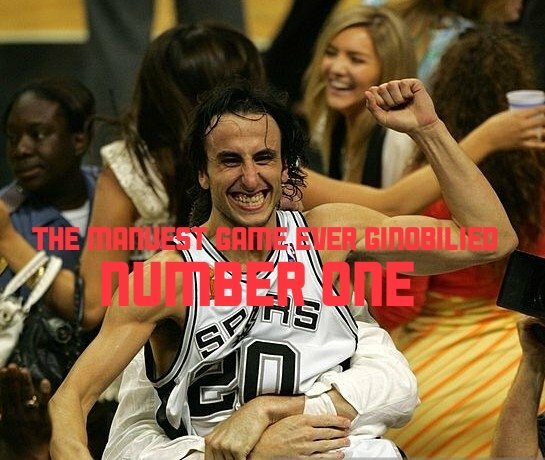 Whether its a game-winning three, a game-saving block, a series-shifting burst, or a championship punctuating dunk, Game 7 against the Pistons will always represent the ultimate essence that is Manu Ginobili. Thanks everyone for putting up with my laborious process here and reading about my favorite Manu games ever! Check out below for links to the rest of this series. I appreciate any comments (praise, insults, constructive criticism, whatever)!